Rinaldi: What would you do in the last hour of your life? 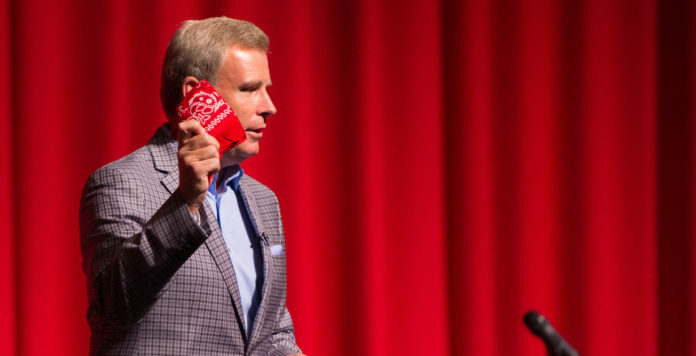 Journalist Tom Rinaldi was a guest speaker at Northwestern State University, discussing his book “The Red Bandanna,” which tells the inspiring story of Welles Crowther, a hero of 9/11. NATCHITOCHES – It starts with one word: Try. “Have a story. What we hope is there is a story that we leave behind,” journalist Tom Rinaldi told an assembly at Northwestern State University Wednesday. Rinaldi, the ESPN contributor and TV personality discussed his book “The Red Bandanna” and the life of Welles Crowther, an athlete and volunteer fire fighter who worked at an investment bank in the south tower of the World Trade Center and who lost his life, but saved many others during the events of Sept. 11, 2001. “What would you do in the last hour of your life?” Rinaldi asked. Crowther, 24, grew up in a suburb of New York City, was an athlete at Boston College, a volunteer firefighter and worked on the 104th floor of the south tower. Rinaldi recalled the horrific events of that day when the towers were filled with smoke, fires and confusion. The red bandanna was Crowther’s signature, something he had carried since childhood in his pocket or under his helmet when competing as an athlete. Crowther made two trips from the tower’s sky lobby to lower floors leading small groups, and once carrying an injured woman on his back, down a stairwell to safety. Survivors later described “the man with a red bandanna,” which he used as a mask of protection in the smoke and debris. His remains were found months later among those of New York City firefighters. “He was an imperfect man,” Rinaldi said, but he was mentioned by name during dedication ceremonies of the National September 11 Memorial and Museum by President Barack Obama who called Crowther a hero. Rinaldi presented a message of learning to give more, do more for others make the hours left to one count. “As you embark on your journey, take an index card and write down ‘What I really want to do is ________.’ You can change the card 100 times on your journey but it’s hard to get to where you want to go if you don’t have a destination,” he said. To conclude the lecture, ESPN reporter and Northwestern State alumna Carley McCord moderated a short question and answer session with Rinaldi, who said he enjoys speaking to college students because he was first a teacher and that what people most want to feel fulfilled is to be competent, authentic and connected. Rinaldi’s appearance at Northwestern State was sponsored by the Student Government Association in partnership with the Office of First Year Experience.